Concrete has moved indoors from driveways and front paths as a popular choice for countertops. Don’t picture a flat slab of gray concrete sitting on top of your kitchen cabinets, though-concrete can have a variety of finishes, from unembellished to sleek and modern. For a textured look, the countertop can be embedded with marble fragments, glass chips, or even fossils. Concrete countertops can be shaped to fit any kitchen and can even be used to create different types of work surfaces such as cutting boards. Concrete, which is made from cement, aggregate, and other additives, is a sustainable material. All its components are abundant and natural, making it an ideal option for homeowners interested in having a green lifestyle. Concrete countertops do require more maintenance than traditional materials. Because concrete is porous, liquid can be absorbed and damage the surface. Especially damaging are highly acidic liquids such as vinegar, citrus juices, and wine. 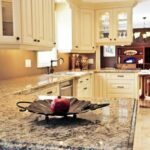 Although concrete countertops are sealed to prevent staining, the sealant may be broken down by heat or chipped by knives or other sharp implements. Concrete is not flexible, so, as it settles, hairline cracks may appear in the surface. 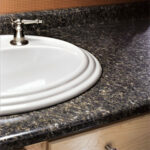 These are only superficial and will not affect the countertop’s durability or performance. 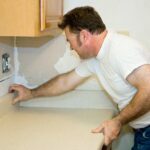 If the sealant is kept in good condition, the cracks shouldn’t become discolored- depending on your aesthetic, they may even add to the appeal of the countertop. Installing a concrete countertop is best left to a professional fabricator since the nature of the materials used to make up concrete require precise mixing and pouring to create the desired surface. In addition, every professional has his or her own proprietary method for finishing concrete countertops. Professional fabricators can also properly reinforce the concrete, if it is necessary, with fiberglass, rebar, or wire mesh. Ask around to find a reputable fabricator and then request references so you can judge the work for yourself. Be sure to ask how the fabricator reinforces and seals the concrete-the countertop should not need any support for at least 3 feet, and epoxy is generally the best (though most expensive) choice for a sealant. If you are eager to pour your own countertop, there are kits available that come with the necessary materials and tools. However, you should do a test cast offsite so you can experiment with techniques and finishes before you start on your kitchen. While concrete has gained in popularity as a material for countertops, in recent years the need for more structurally sound, lighter weight concrete with greater design flexibility has arisen in the countertop materials market. Enter glass fiber reinforced concrete (or GFRC). GFRC is essentially an ultra-strong composite made of Portland cement infused with randomly dispersed glass fibers that reinforce the concrete and increase its load-bearing capacity. One company, Absolute ConcreteWorks of Seattle, is on the front line of pre-cast GFRC technology. It produces an extremely lightweight yet durable material that can be used to create countertops as thin as 3/4 inch that, when cast and finished, require no grinding or polishing. Special edging or other treatments can be cast separately and integrated seamlessly. A major difference between GFRC and traditional concrete is that GFRC allows for limitless design opportunities. For example, landscape elements from a customer’s property can be incorporated into the design-anything from fern leaves to tree branches to stones. 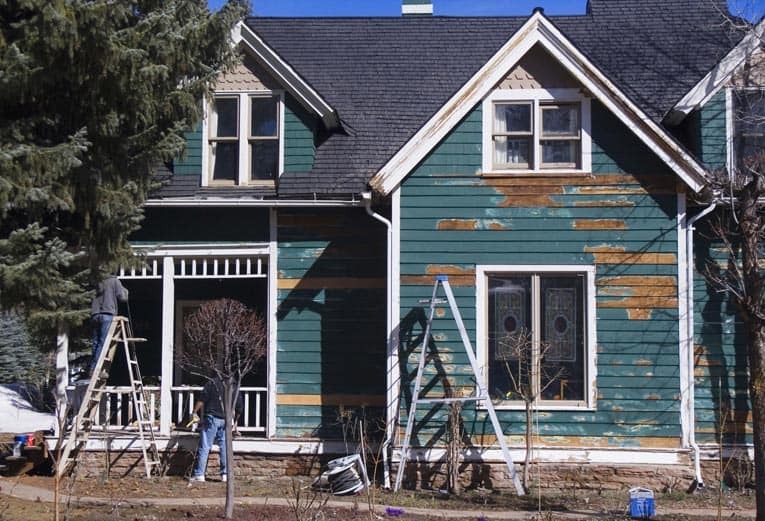 All painted details are done by hand with rollers and sponges, and final touches are applied with intricate brushwork. This technology goes hand-in-hand with the burgeoning industry focus on and consumer interest in “green building.” When a countertop is created, there is no waste-whatever material is left over is used for another project. And, the materials used to make the countertop are themselves easy on the environment. The glass elements are from reclaimed or recycled materials, and the cement mix includes fly ash, which is the waste produced by industrial smokestacks. The finishes are also eco-friendly; these water-based materials give off no pollutants or toxins during production.